VF-2 "Bounty Hunters" jet positioned for launch. Taken on a mid-80s cruise by Dave "Bio" Baranek. Our primary purpose is to maintain contact among the members of the Tomcat community, keep members informed of developments in Naval Aviation, provide support to museums where F-14s are on display, and sponsor annual reunions of the F-14 family. Membership is open to anyone who has flown, worked on, or just plain love the F-14 aircraft. This website is dedicated to the aircrews who risked their lives fighting for our freedom, the maintainers in the hangars and shops who kept these jets flying, the managers and support personnel who continually found the funds and supplies needed to hold it all together, and finally, the engineers, scientists, technicians and artisans who designed and built the F-14 and who through the years came up with the improvements to keep it in the air for 36 years. Greetings and Happy New Year! I hope you had a pleasant and restful holiday season. As I reflect back upon 2018, I’m thankful for a great San Diego reunion (more on that later), and it occurs to me that it is important to reflect on where we’ve been as an Association. Starting with Art Martin’s vision to form an F-14 Tomcat Association that would be similar to the Intruder Association, back around 2002, a small group of us formed an exploratory committee, drafted by-laws, and did the legal work to be a non-profit (Art Martin did most of that work). Finally, the first Board of Directors met and adopted the Association By-Laws at a meeting held 17 December 2003. Art was the driving force for starting the association, and for 11 years was the driving force to reach out to people, to conduct bi-annual reunions, and to grow the group. Art was born June 20, 1945 in New York. He joined the Navy in 1963 and served honorably until 1967, then joined the Grumman Corporation, later Northrop Grumman. On July 7, 2014, at 9:20 p.m., the world lost a great man when Art passed away from complications of a surgery. His lovely wife Donna still lives in Camarillo California. We all miss Art – may he rest in peace. Three of us original members are still on the board. I announced at this year’s reunion that I will be stepping down as your President as soon as the next President is elected. We intend to hold elections early in 2019 as our by-laws require. Here is your chance to be part of F-14 Tomcat history! The F-14 Tomcat Monument Association is leading the effort to construct a monument to the greatest fighter that ever flew. Please check-out their website and make a contribution. Any donation is appreciated! There are also donation levels that will get your name inscribed on the memorial - a great way to forever mark your support and love of the Tomcat. This is also a unique gift opportunity! Please go to the F-14 Tomcat Monument site (below) for more information! Always, Baby...! 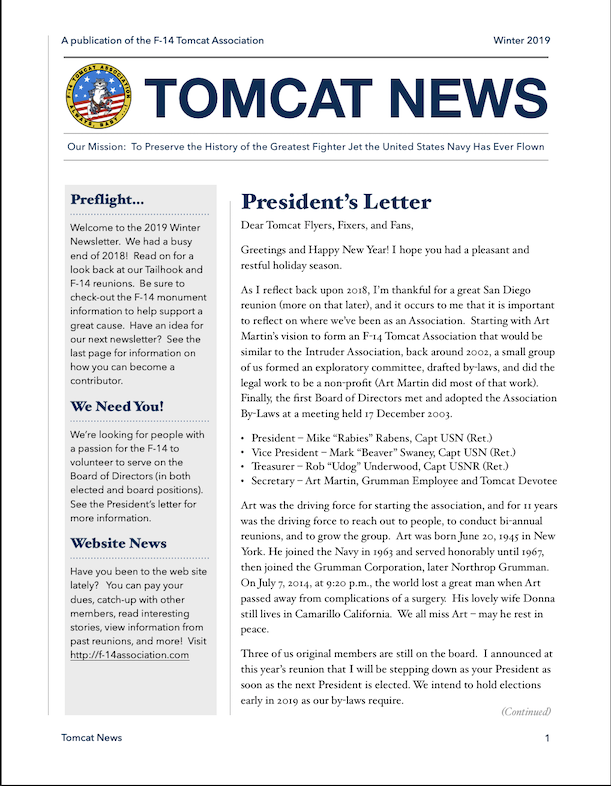 Please check-out the latest release of Tomcat News! Members of the F-14 Tomcat Association can access the newsletter from the Newsletter link (under the "Members Only" menu).